We were just getting on the New Jersey Turnpike when Danny Engel bent over his guitar and placed his lips on those of Debbie Lieberman. Both of them were sitting on the floor in the aisle of the crowded bus that was taking our Washington Metro Area Midrasha’s students back from a Chabad Shabbat in Crown Heights. Sam and I were sitting on a pair of seats to their left, me the aisle and he by the window, just behind the couple, giving us an excellent view. 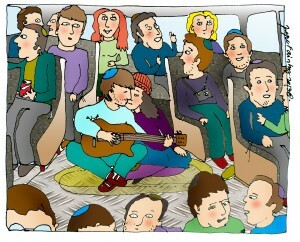 Danny had started strumming and singing softly to Debbie right when we left Brooklyn. Ripples of streetlight, filtered through the long adolescent locks of the kids in the bus, played like starlight over the lovers. I was jealous. Nothing like that ever happened to me. And I kind of liked Debbie. Sam paused in his narrative about the young family he’d stayed with as he followed my gaze. We waited for Danny to raise his head softly and look deeply into Debbie’s eyes. But that got boring after a while, so Sam got back to his story. He stared at Danny and Debbie. Debbie opened her eyes for a second and I thought she was looking at me. I looked back. Or was it at Sam?